Did you know that finding a reputable Sunset Valley plumber to work with is one of the most important tasks that you can take care of? Other than an electrician, finding a skilled plumbing service provider is basically just as important. Yet the average homeowner puts this off and tries to find just the right expert for the job – once something goes wrong. Avoid making the mistake of getting poor quality work by picking out a Sunset Valley plumbing company ahead of time. This is the type of research that will lead you to our team here at Moore & More Plumbing. Ask around and local home and business owners alike will tell you the same thing – we take this line of work seriously. Which means we also take pride in the results we get for the customers we work with. The driving force behind the work we do is being able to provide 100% satisfaction to all the customers we work with. Now, let us show you how we have earned the solid reputation that we have through hard work. Drain Cleaning Services – Every homeowner has experienced the inconvenience of having a slow or clogged drain. One of the big issues is that too many people try to take care of this on their own by pouring harsh chemical cleaners down the drain. Get a long term solution that won't harm your plumbing by calling on our experts for drain cleaning in Sunset Valley. Constant Pressure Systems – A very common problem that homeowners report, when it comes to well water, is not having constant pressure. If you would like to be able to have constant ongoing pressure for your water, let us install this system for you. This will enable you to lose lose pressure when another water based appliance is in use and will even allow you to install irrigation. 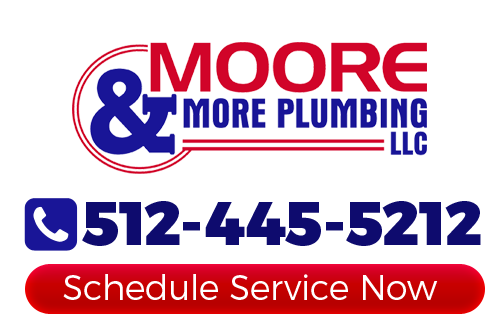 At Moore & More Plumbing, we want to be able to take care of your plumbing services in Sunset Valley, TX. We know that we are able to deliver the best in results and want to be able to extend that to locals in this area. Give us a call today to get started. We look forward to working with you and making sure that you get the top notch service you deserve, and being your preferred plumber in Sunset Valley, TX. If you are looking for a professional Sunset Valley plumber then please call 512-445-5212 or complete our online request form.